With the EOS 700D/Rebel T5i, Canon's made an early move to replace last year's 650D/Rebel T4i, though one with only very minor refinements. Indeed the changes over the 650D are so subtle that it's the older T3i/600D that stays on alongside the 700D - while the too-similar 650D fades into the sunset. Among the few improvements, the 700D includes a new mode dial that turns 360 degrees, a new 'upmarket' body finish; and real-time preview of Creative Filters in Live View mode. Apart from those additions, the 700D is essentially identical to the 650D, making this the least distinct upgrade we've seen in this range of cameras. Elements carried over include the 18MP CMOS sensor, a 9-point cross-type AF sensor, 3-inch, a 1.04m-dot vari-angle LCD screen, and Full HD video mode. Its Hybrid AF system was also brought over from the 650D, and while the simultaneously announced 100D/Rebel SL1's Hybrid AF II covers a wider area than the one here, neither is said to be any faster than the rather slow implementation on the 650D. The only other significant change made over and above the 650D is the ability to preview and apply Canon's 'Creative Filter' processing effects at the point of shooting, rather than adding them as a post-shot process. This ability to preview the effect (as now offered on the majority of cameras), makes it easier to pre-visualize how the final result will look - helping to inspire the capture of images that only work well in conjunction with the processing effect. Meanwhile, the simplified mode dial removes any possible frustration of running up against the end of the dial's range of motion, and the larger, raised icons could be easier to find and use in low light situations. 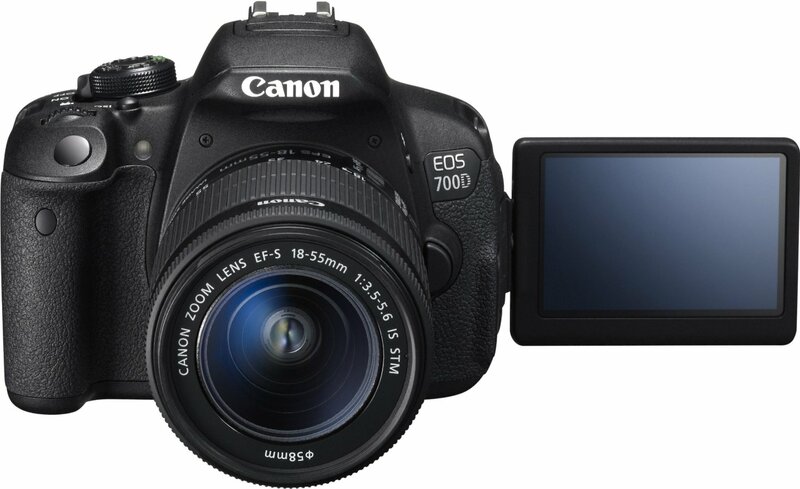 The EOS 700D, like the 650D before it and the 100D announced alongside, features a touchscreen. The screen is capacitative rather than resistive, meaning that like the now-ubiquitous smartphone, it's sensitive to contact rather than pressure and capable of interpreting more complex user input. In Live View and Movie modes the screen can be used to specify the point of focus and release the shutter, as we've seen before on several mirrorless cameras. It also supports multi-touch and gestures, meaning that it offers phone-like pinch-to-zoom and image-to-image swiping in playback. The results is a user experience that smartphone users will immediately find familiar. Like the 650D, the 700D's entire interface can be controlled by touch in a completely seamless fashion, including the onscreen Q menu that's used to access secondary functions, and the entirety of the menu system. Fortunately this doesn't come at the cost of external controls, and the EOS 700D offers essentially the same level of button-and-dial operation as its predecessors; the screen simply adds an additional control option.